« Day 181 in Beijing: Happy Birthday, Janice! Scottish Style. 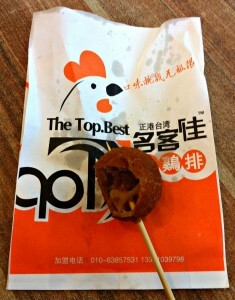 Day 182 in Beijing: Fried Taro Root Dessert. Fried taro root on a stick. At the same restaurant where we met that cute little girl and her mom, we decided to try a fried taro root dessert. 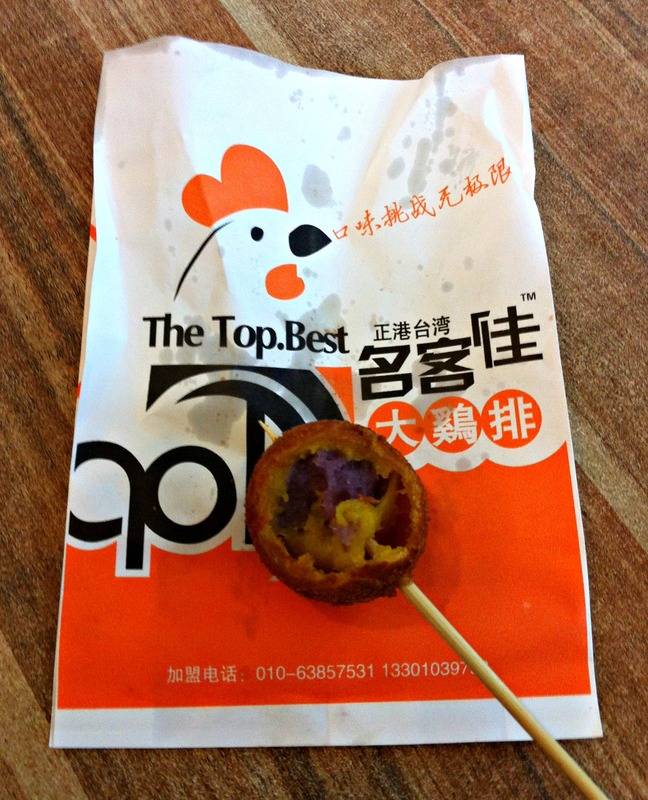 Jill had never had taro root so it was a new experience for her. 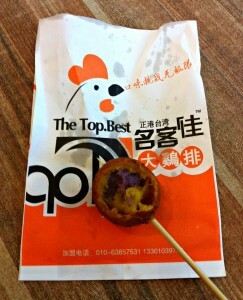 I had taro when I lived in Japan and have had it here in China also. It is a sweet dessert and, I think, quite tasty when done wall. Jill tried it and didn’t care for it very much so I ate her portion. Chinese people here really love sweets. That may sound like a generalization about Chinese, and it is, but maybe this sounds weird because most people, all over the world, like sweets. That is not what I’m implying. Side view. The root is purple. I’m talking about sweets in a way that I would have never imagined sweets being made. I’ve seen sugar put on pretty much anything and everything here. I’ve seen sugar added to barbecued corn. I’ve seen sugar added to salted peanuts. We’ve had salted popcorn that then had SUGAR added to it also! We bought it by mistake and won’t ever do that again. It is a jarring, and not satisfying, experience. At least, according to my Westernized palette.